I like old stuff sometimes. I like old cars (except having to repair and maintain them). But then again, I just like cars. I like old music. In fact, any music released past about 1992 I'm really not interested in. Seems the music has gone downhill since then. But I like new. I used to be an "early adopter." I've had a computer of some kind since 1982. 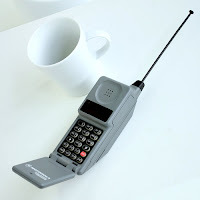 I got my first cell phone in 1993 (and it only made phone calls). Back then cell phone usage was around $1.00 per minute plus long distance (if any). Quite the contrast with today with unlimited minutes and no long distance charges. And there was this thing called "roaming" were if you left your home area (If I remember right, that was your area code) the costs went up even more. I'm not a fan of antiques, but I do like the classical look when it comes to furniture. Of course, "old" music is pre-1990. Old cars are pre-1970. Old cell phones are pre-2015. So what's old depends on what you're talking about. So do you prefer old or new stuff? Let me know in the comments.